This versatile pack is the current issue MOLLE II LARGE Rucksack in the ACU Digital Camouflage NSN#5465-01-523-6276. 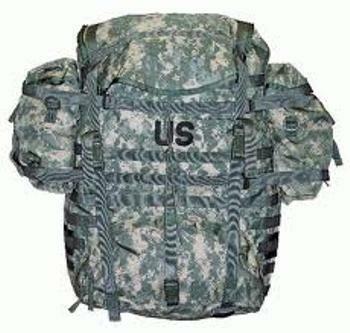 This pack is made in the USA for the United States Army. It has the correct new improved version of the foliage green composite frame, shoulder strapes and molded waist belt, all of which have been enhanced and improved for greater comfort and durability. This pack comes as pictured with the two side sustainment pouches. The integrated sleep system compartment is large enough to hold the complete Mod II sleep system (sold separately in our store) or any other sleep system and is easily accessed through a bottom zipper so you don't have to dig through the large pack to get your sleep system ready for the night! These packs are all in perfect functional condition, there will be no functional flaws what-so-ever. They might have had a name tape sewn on, or a name or unit number written on them somewhere, you might find a few dirty spots mostly from storage. They were all bought as a big lot directly from the US military at auction and have been in storage so might show some dusty/dirty spots. Expect a Ruck that is in used/excellent condition meaning everything will function optimally and there will be NO functional flaws of any sort. - $99.00! We don't know HOW Glenn finds genuine items, at great prices like this, grab one while they last.